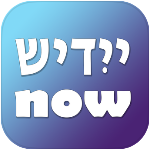 The Yiddish Alphabet Now App is now available!! Yiddish Alphabet Now app is a learning tool to help you learn to read and write both the print and the cursive Yiddish alphabet and letter pronunciation. Yiddish uses Hebrew letters, however the letters are used a bit differently. The entire alphabet with the Hebrew letters is presented in 8 lessons that cover both print and cursive scripts and specific Yiddish pronunciation and use. After covering each lesson, a multiple choice quiz will help you test what you’ve learned. With its simple interface you can learn the ‘alef-beys’ in a few days. The app contains no adds and does not require an Internet connection to function.